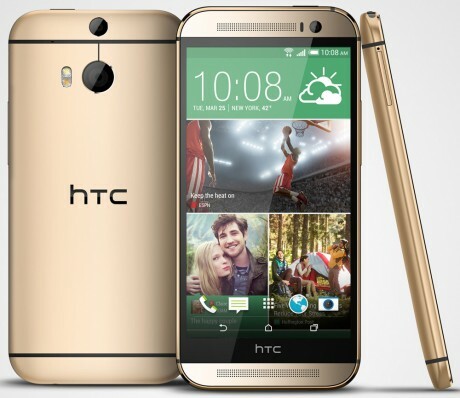 HTC today announced the One, an update to its top-of-the-line smartphone for 2014. The new One uses more aluminum in its design and increases the screen to 5-inches with full HD resolution. The One features a two-camera design that lets users create 3D images and add other effects after the image has been taken. The main camera uses the same 4-ultrapixel configuration last year's device did, but uses a dual-LED flash, upgrades the ImageChip, and boosts the user-facing camera from 2-megapixels to 5-megapixels. The camera boasts an improved Zoe mode, HDT mode, the ability to take images using both cameras at the same time, as well as save camera presets for later. The One is powered by a 2.3GHz quad-core Snapdragon 801 processor, which is accompanied by 2GB of RAM. The device will be offered with 32GB of storage in the U.S., and supports microSD cards up to 128GB. Despite the all-metal design, the HTC includes NFC, Bluetooth 4.0, dual-band Wi-Fi, and support for U.S. LTE 4G networks. In addition to the hardware updates, HTC revealed Sense 6.0, its Android user interface overlay. The new version of Sense makes it easier to add content to Blinkfeed and manage home screens; adds lock-screen gestures that anticipate what the user wants; simplifies the camera and video camera software; and improved TV guide/remote software. HTC says the battery is 40% bigger than last year's phone, and it comes with "extreme power saving" mode, which shuts down all but the most essential apps when the battery reaches 5% and still provides for another 15 hours of battery life. Along with the One, HTC announced the Dot View case, which is a wrap-around case for the One. The front of the case is speckled with dots. Using the case puts the phone into an alternate notification mode that will use the dots to display notifications for incoming calls and text messages. The Dot View cast will be available separately for $50. The HTC One bears a full retail price of $649 and will be available soon. Here are some quick and dirty thoughts about the HTC One, which has an all-metal design, 5-inch HD screen, and a rewritten user interface. HTC's new flagship Android smartphone ramps up the drool factor with its all-aluminum design and updated software. Here is Phone Scoop's full review of HTC's mobile marvel. The One is a dazzling piece of hardware that has but a few foibles. This Android smartphone from HTC delivers on nearly all its promises. Sprint is selling a special edition of the HTC One with Harman Kardon headphones and tuning for improved sound. This could be the Android smartphone audiophiles have dreamed about. The HTC One can be purchased in the U.S. beginning today. The phone looks great, I would love to have it, but why the F#$^@ is the name ONE? maybe its for marketing purposes or its just dumb. HTC has several phones with the name ONE, (X, S, V, etc), HTC should at least named it HTC two or HTC one II, I'd eveb be OK if oficial name was HTC One M8, but oh well. Well, it's official name is "One (M😎". So... it's close to what you said. Apple does the same with many of their products. There have been many MacBook Air models by now, all called just "MacBook Air". I would love to see a WP8.1 variant of this phone. It would only help bolster the growing ecosystem. Not that I don't love Nokia, but this would definitely be a great alternative, with proper and full support of HTC. That would definitely be great. I'd also like a Google Play edition of this. EDIT: D'oh, looking up the news feed for phonescoop, I see it's already been announced.